A cracking little supper dish or side, this. For my part I’ve taken to making it as a sandwich filling for our cafe, but it is just fine on its own with some warm bread, ricotta or yoghurt and salad as playmates. Preheat your oven to gas mark 5 (200C). Pop the cauli, onion, garlic, nuts and raisins in an oven dish, rub it all over with the pickle (sorry, but yes – you’ll just have to get your hands dirty), and dot the tomatoes on top. If you are using a relatively un-oily pickle, you may need to add a little extra oil to the dish. Cover the dish with foil and bake for around 35 minutes (stirring it after about 20 minutes) or until the cauli is just cooked. Such a very very easy thing to make, no? 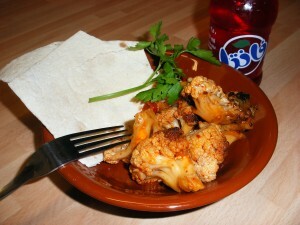 This entry was posted in Recipes and tagged cauliflower, Kashmiri cauli, pickle, vegan. Bookmark the permalink. Hi Sally, my name is Kimberly and I am a social worker, mom and plant-based blogger, living just up the road from your shop in Catford. I used to work in Peckham though, so know the area well. That all sounds just great. Look forward to reading your blog! Come and say ‘hi’ next time you’re in Peckham. It’s up on the blog. SO hope you like it!